Ready to some not-so-spooky fun? 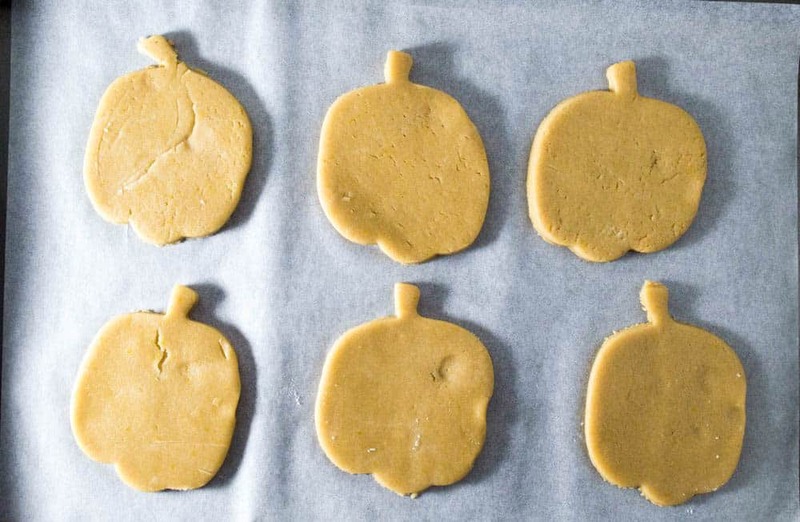 These pumpkin-shaped Halloween cookies are just calling for you to make them with your kids! I know, I know, you’re thinking “Halloween isn’t for a while yet!” HA! Believe me, time flies, it will be here before you can even finish blinking. Case in point, I thought to myself that I had SO much time to get ready for back to school season. The night before the first day, my son and I were rushing around like crazy people trying to get everything done. So the way I see it, Halloween is practically tomorrow! 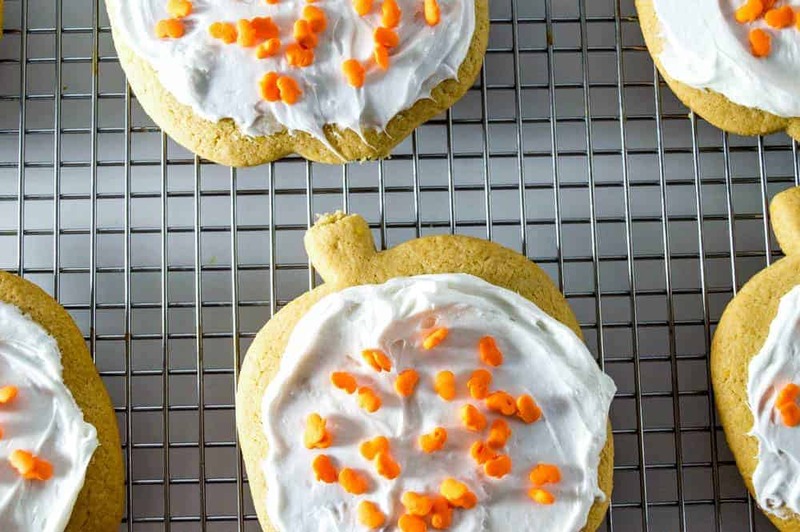 Here’s the great thing about this pumpkin shaped cookie recipe: you can use the base recipe and switch up the rest for just about any holiday. We’ve even used this base for our chocolate chip cookies! Let’s check out how to make it! Don’t forget to watch the video tutorial and print the recipe card below. 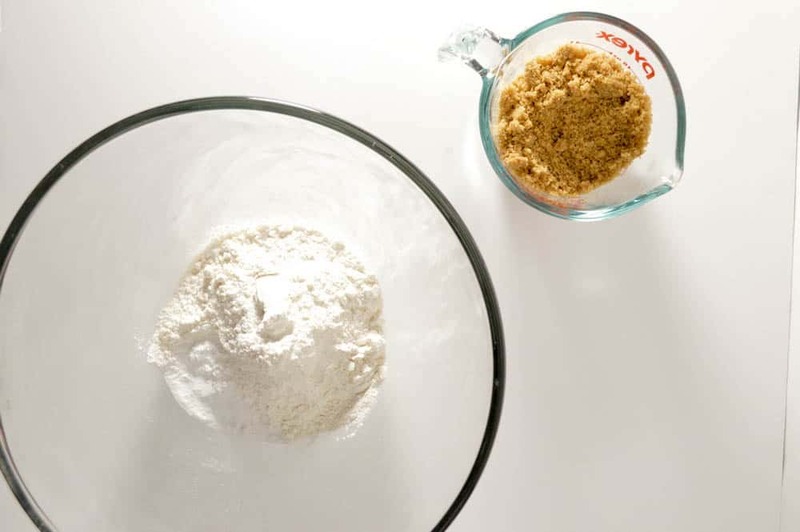 Add the flour mixture to the wet ingredients. Drop by rounded teaspoons onto a lightly greased cookie sheet. A lot of recipes say ungreased, but I find that just a smidge of greasing makes the cookies slide off without getting stuck unless you have a newish nonstick cookie sheet . Remove from cookie sheet and cool on a wire rack. Once cool, add your buttercream icing and your decorations, then enjoy! Drop by rounded teaspoons onto a lightly greased cookie sheet. A lot of recipes say ungreased, but I find that just a smidge of greasing makes the cookies slide off without getting stuck unless you have a newish nonstick cookie sheet. 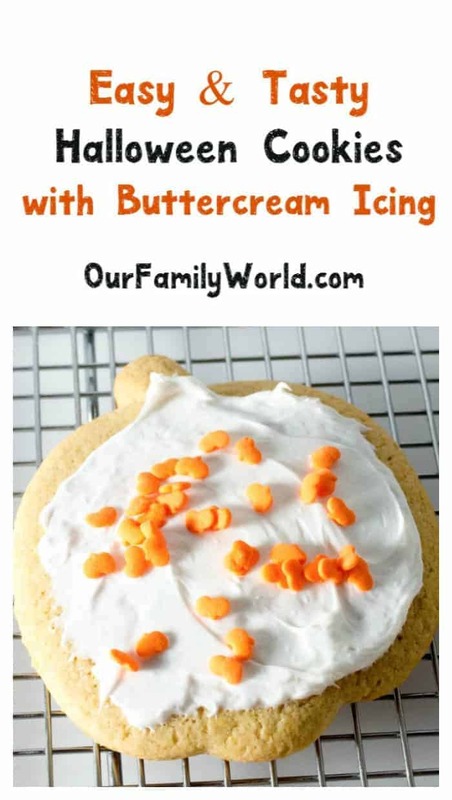 These Halloween cookies really are so much fun to make with your kids! The younger kids can help stir the dough and add the decorations. If you have older kids, baking together is a great way to reinforce math skills! For more fun Halloween recipes for kids, check out our Monster Bento Lunch Box and our Creepy Spaghetti Squash Recipe in Pumpkin! Are you getting ready for October and all the spooky (or not-so-spooky) fun yet? Do you have any favorite Halloween recipes for kids? Share in the comments! These cookies look delicious! Thanks for linkin’ up with What’s Cooking Wednesday! It is really the more simple the better when it comes to celebrating holidays! Love it. I love buttercream icing! These look like so much fun to make with the kids. The seasons don’t change here, so it doesn’t seem like Fall. I’m getting excited about it though because of posts like this one! Nothing beats a delicious sugar cookie with thick and creamy frosting. Can’t wait to get started on our cookies. Thanks for sharing. These look so delicious! Easy too! I’m always searching for things the kids can help make for holidays! Halloween is one of my favorite days of the year. I can’t wait to celebrate the upcoming holiday with sweet treats. These look so yummy! Any cookie with buttercream frosting is amazing! Does it get any better?! These are so cute! My kids will surely love these! I can’t wait ti try and show it to them! Halloween is one of my favorite holidays. I would love to make these adorable pumpkin shaped cookies with my girls this year! Wow, these look amazing… Halloween already…time is flying by. These look absolutely amazing! I love the fact that autumn is well on its way – yay for cooler weather! Oh making these cute cookies would be fun. I love the pumpkin shapes. I can’t wait to start the halloween treats and decorations. Fall means baking season is beginning and I can not wait. These cookies would be a fun way to start the festivities. So cute! We love making cookies, especially for special occasions and holidays. This looks like fun, my kids would love them! My kids and I love making cookies! I think these would be the perfect Halloween activity! I can’t believe it’s time to start thinking about Halloween already. These cookies look so easy and tasty too. These are perfection!! I can’t wait to share this recipe with my kids-it’s always a fun way to prepare for the Halloween holiday! I was jus thinking about how much I love fall food! My kids would love making these cookies. Those are so adorable! I love to make themed cookies with the kids for every holiday. It’s so much fun!